Thiazole red homodimer (TRhD), also know as TOTO®-3, is a cell-impermeant, high-affinity, far-red fluorogenic nucleic acid stain. 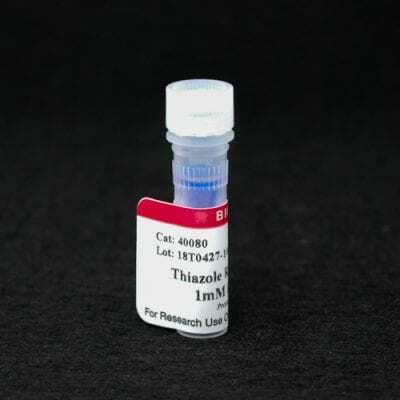 Thiazole red homodimer (TRhD), also know as TOTO®-3, is a cell-impermeant, high-affinity nucleic acid stain based upon a symmetric cyanine dye dimer. The dye is essentially nonfluorescent in the absence of nucleic acids, but exhibits excitation/emission maxima ~642/660 nm when bound to nucleic acids. TRhD is also used as a nuclear counterstain and dead cell indicator. TOTO is a registered trademark of Thermo Fisher Scientific. Hoechst dyes are cell membrane-permeant, minor groove-binding blue fluorescent DNA stains. Hoechst dyes are widely used in cell cycle and apoptosis studies and also as nuclear counterstains.